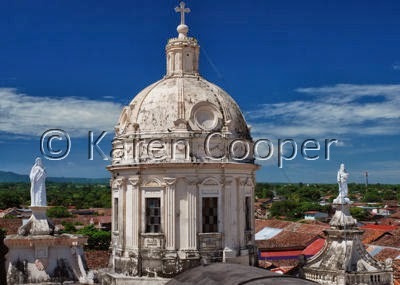 La Merced Catherdral in Granada, Nicaragua boasts a pretty kewl bell tower with a sweeping view of the old colonial buildings of Granada and Lake Nicaragua in the background. On a clear day you can see Ometepe Island. So far I haven't seen a day that wasn't clear. The climb to the almost-top of the bell tower is fun. A spiral staircase with steps fit for tiny childlike feet, winds its way upward, enclosed in thick white adobe walls. You can almost imagine the people of days gone by climbing their way up there for the views or the breeze. I don't think you can sit up there contemplating life when the bells are rung. Make the fillings in your head rattle around for a bit I bet. As usual, I can't find a lot written on La Merced Cathedral. Like many of her sister cathedrals here in Granada, she was almost destroyed in civil wars, been rebuilt, and is still a work in progress. She is impressive for her size and views of the city and surrounding countryside. And who can pass up a bell tower with real bells? Great blog - Love your pictures. Thanks for your review on blogcatalog. This is such a pretty picture. I agree, real bells are really hard to find as everything around here is all electronically done. Thank you for the nice comment on blogcatalog.